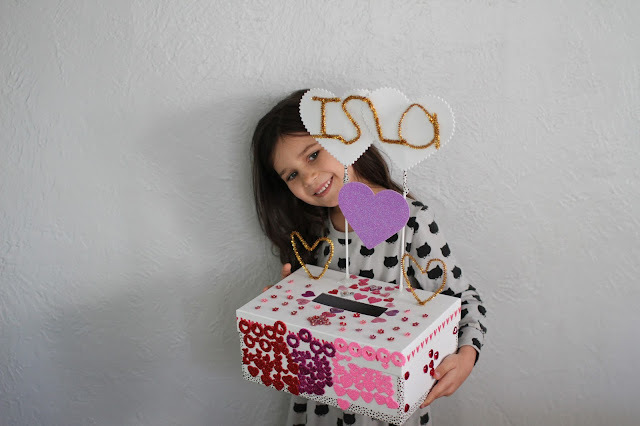 Like most holidays after having kids, valentines day has sort of been taken over by the children. Since starting elementary school, they make these valentines boxes to collect their valentines in. 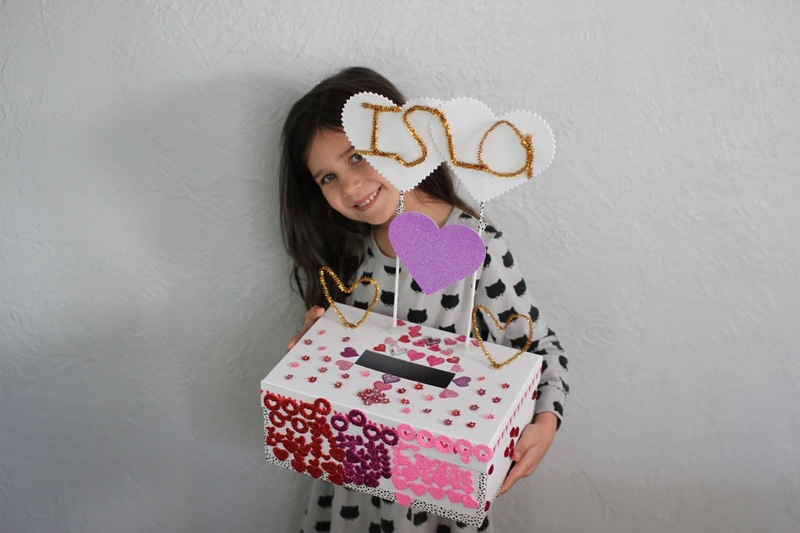 I have learned, like most things in school, the parents make really cool boxes for the kids. I guess I sort of thought school was for my kids not me, so I let them take the lead on it. As you can see, Isla went a little crazy picking stuff out at the craft store. She didn't even use all the supplies she (cough, cough, I) bought! I did help her with the hot gluing, but all the placement was hers and she did each and every sticker on that box...there has to be at least a hundred! Connor went a more minimalistic approach. 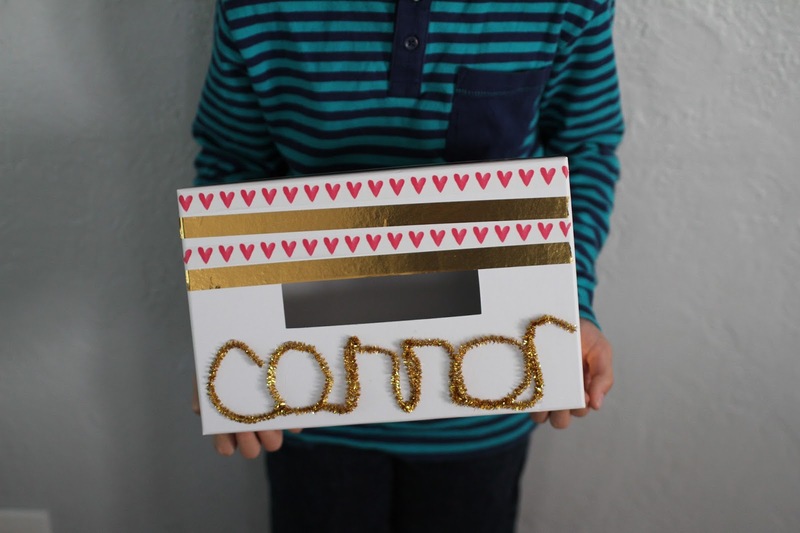 He made stripes on his box and he did it completely on his own. If you couldn't tell, he really likes gold. A few days ago, I had a mom say something along the lines of, "I think it's great you are able to let your kids do their projects on their own. I just need my kids to look nicer and can't do that." It's one of those insult-complements that leaves me all....uh, thanks? As I've learned in the almost three years "I've" been in elementary school, the parents definitely fall in two categories. They either let their kids take the lead or do it all themselves. At times I have felt self conscious about kids projects they did on their own compared to say the project that a mom spent FOUR HOURS making. 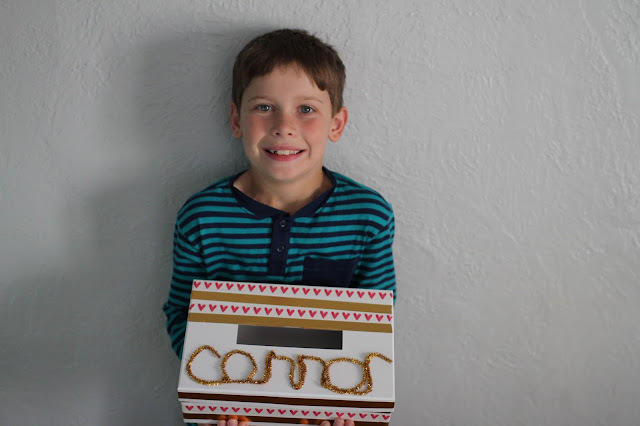 Yep, a mom really told me she spent four hours making a project that Connor maybe spent thirty minutes on. It's a hard line to walk though. Making sure your kid takes pride in their work while having a project sitting next to something a 40 year old did. I want them to learn to do things on their own and take pride in their work. Wow, I've really gotten off topic there! So, valentines day, we are ready for you! The kids boxes are all made. Their valentines for their classes are all filled out. And I may have actually gotten Ian something super small...you know, to say, "I love you and want you to know it, but also don't want to buy into the whole fake holiday thing." My kids have obviously totally bought into it. As they do with every holiday. They are ready for their parties at school. And I am ready with a little valentines treat for their lunch boxes.